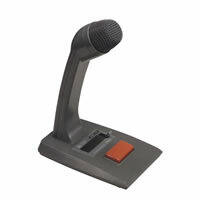 Paging Microphone with large talk switch (with locking lever). Features a fitted 2.5m lead, unbalanced output, push to talk function, remote control contact. Desktop type dynamic microphone with cardioid polar pattern. Short-off press to talk switch with open OFF type extra switch contact. 600 Ω balanced output impedance. 2.5m 4-conductor (included twin-core shielded) cable with 5 pin DIN plug. Can be remotely operated with additional components such as priority and transmitting / receiving relays. Output Impedance at 1kHz 600 Ω, balanced. Cable 2 core shielded plus 2 core cable. Terminal of Cable 5 pin DIN plug. Talk Switch Push to talk type (short-off circuit with lock lever). Remote Switch Leaf spring contact (interlocked with talk switch). Finish Head; Zinc plated steel wire, baked painting, Grey / Body; ABS resin, Grey.